Color(s): Any color Coat: Thick, short, shiny hair Distinct feature: the Pit Bull has evolved into a marvelous working and companion dog, used for purposes as varied as those it originally performed. 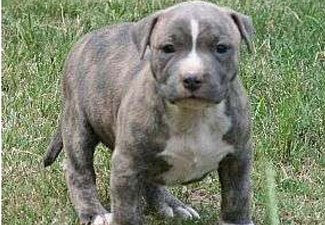 Pit Bulls are employed as police/armed services dogs, search and rescuers, therapy animals, and livestock workers. They compete in all manner of organized dog sports, from herding to agility to conformation to obedience and the bite sports Temperament: Courageous, loyal, full of energy; Should be socialized early on with children and other animals. They make loving pets for children and seniors, and everyone in between. The are indeed one of the most versatile breeds on the planet. Much of this is owed to the activities it once performed. The harshness and physical demands of the activities molded a strong, healthy, stable animal, one anyone should be proud to own. Activity: Needs a substantial amount of vigorous exercise which needs to be on-leash. Enjoys running along side a bicycle. Large Dog Breed Bull Mastiff .. English Mastiff ..French Mastiff.. Neopolitan Mastiff ..Great Dane.. St.BernardMedium Dog BreedAustralian Sheperd ..Beauceron..Belgium Shepherd.. Boxer..Chow Chow..Dalmatian..Dobermann.. German Shepherd..Golden Retriever..Grey Hound..Irish Setter..Labrador Retriever.. New foundland..Pointer.. Rajyapalam..Rottweiler.. Rough Coolie..Siberian Husky..SMALL DOG BREED Basset Hound..Beagle.. Bichon Fries..Bull Dog – English ..FrenchBull Terrier.. Chihuahua..Cocker Spaniel..Dachshund..Jack RusselTerrier..Lhasa Apso..Maltese.. Miniature Pinscher.. Pekingese..Pit Bullterrier..Pomeranian..Poodle..Pug..Samoyed..Scottish Terrier..Shih-Tzu..Tibetan Spaniel..Yorkshire Terrier..